Whatsapp Automation is a collection of APIs that interact with WhatsApp messenger running in an Android emulator, allowing developers to build projects that automate sending and receiving messages, adding new contacts and broadcasting messages multiple contacts. The project uses Selinium, Appium, Python and Android Virtual Device Emulator. Edit configs/dev.cfg file with your mysql credentials, RabbitMQ credentials and Queue names created. Queue names needs to be created prior to running. Create Queue with appropriate name. Create Exchange with appropriate name. Once both Emulator and Appium are running, Now you will run your main app.py file. Specify the environment by typing (export ENV=dev) in terminal, So that dev.cfg is read for configuration. Now similarly open new tabs, activate virtual env and export the dev environment. Then run (python single_message_producer.py). 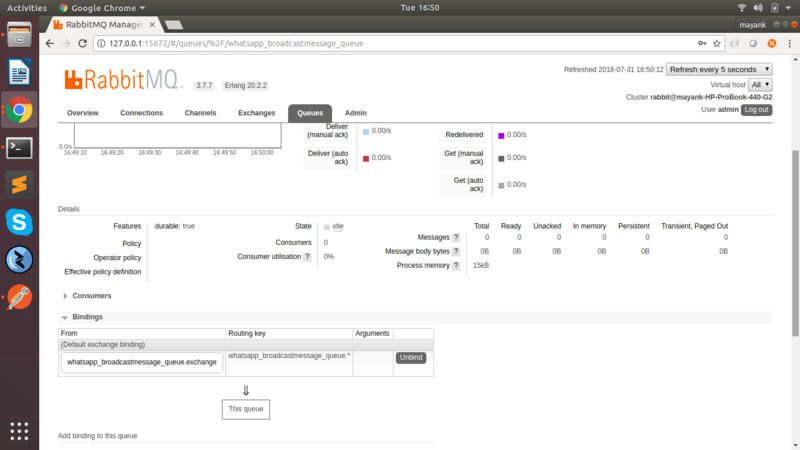 RabbitMQ consumer to listen to single message queue. Now at this point you have your Android Virtual Emulator Running, Appium running, Flask running, and rabbit MQ with workers running. For the very first time you will need to setup Whatsapp manually with some Mobile Number with which it will be sending Messages. You need to verify OTP for Whatsapp and just set it up for use. Now here are the Apis exposed by this project with which everything will be automated.